Look at our track record to see what we are about to do. 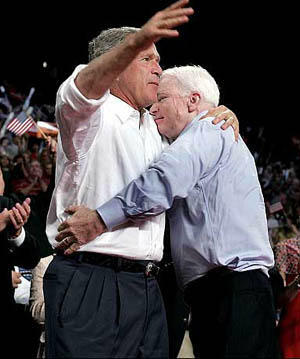 John McCain is about to ride to victory on the same unspoken winning lying promise fed to us by George Bush. It isn’t so much what has been said in the two year primary caucus as what has been withheld from us like gruel from orphans. Our political leaders don’t trust us to know the truth and despite the dire predicament that we are in we continue to trust our politicians. Are we the Indians who sold Manhattan for six strands of rosary beads? We are all now suffering from boiling frog syndrome and the water is now beginning to boil. Because we went golfing on the moon we have decided that we are not animals. Because we are not animals we have no need for clean air, water and soil. All we need is a cleavage revealing Oscar de la Renta gown and an SUV and we’re good to go. George Bush and John McCain are the leaders of the Pro Life party; that would seem to leave the Democrats as the leaders of the Pro Death party. The problem with the Pro Life party is that they are pro unborn life and anti born life, if that life happens to be a Muslim life. We have been warned that because of overpopulation we all would be forced into wars fighting over resources, like oil, water and cadmium. If you need some toxic cadmium then look in your liver and kidneys. God saved Lot, Lot’s wife Eve, and their two young virgin daughters when he nuked the evil cities of Sodom and Gomorrah into the dirt. The only condition was that these four people were not allowed to look back. Curiosity got the better of Eve and when she looked back God turned her into a pillar of salt. The girls then put pebbles in her eyes and shoved a carrot in her nose and celebrated the first Christmas, three thousand years before the birth of the Messiah. It is hard not to look back at George Bush, John McCain and Hillary Clinton leading the charge into Iraq in 2003 but we must force ourselves to look at where we are right now, and figure out what to do about it. Right now John McCain, Hillary Clinton and Barack Obama are fighting over a Trojan Horse. It is as though the American people have built a giant wooden horse in the image of Jeremiah Wright, hidden their secret foes overpopulation, industrialization, pollution, climate change, a bankrupt economy, homelessness and joblessness inside of Eight Belles and pushed her off a cliff. How can we, who elected George Bush twice, be trusted to elect the proper person President? Perhaps we should outsource our voting to China along with our jobs. President Bush is heading to the Beijing Olympics this summer to watch Chinese workers make Barbie dolls. One of the conditions China has imposed upon the United States in order not to foreclose on the mortgage they hold on the United States, along with Saudi Arabia and Dubai, is that the American women must tank the synchronized swimming competition. The Chinese government is hoping that nobody realizes that the pool water is laced with cadmium. George Bush has managed to balloon the national debt to 10 trillion dollars, with another 2 trillion needed to rebuild the armed forces. Bloggers worldwide have been waiting for another 911 false flag attack to launch us into nuclear war with Iran. In the meantime, the false flag attack has already beeen carried out right under our collective noses. If it costs Saudi Arabia and Iraq $2 per barrel to get the oil out of the ground, how are the Saudis managing to charge the US $120 per barrel of oil for 10 million barrels per day? George H. W. Bush, George W. Bush, Bill Clinton and Hillary Clinton have been bought and paid for by Saudi Arabia’s King Abdullah and the Emir of Dubai. The Senior George Bush sits on the board of the 200 member 75 year old Royal House of Saud, for which he has been paid hundreds of millions of dollars. The Saudi bin Laden family financed the oil company of George W. Bush. Hillary Clinton refuses to disclose that Saudi King Abdullah donated $10 million to the Bill Clinton presidential library. The wax statue of the fellating Monica Lewinsky cost $200,000 alone. This oval office scene has replaced the nativity scene in American culture. Hillary Clinton’s tax return showed that Bill Clinton is receiving millions per year from the Emir of Dubai for doing nothing. Because George Bush, John McCain and Hillary Clinton invaded Iraq, the United States is now in a pretty pickle. If the United States just stays in Iraq then our economy will continue bleeding to death. If the United States leaves Iraq then Shiite Iran will annex Shiite Iraq, especially the oil rich south. At this point it will only be a matter of time until Iran goes for Kuwait, the Gulf States, Saudi Arabia and Israel. When this happens Iran will choke off the American oil supply, build nuclear bombs, give them to Hezbollah and Hamas, and take over the Middle East. The Democrats know this, and this is why even though they were elected in 2006 to leave Iraq, they never cut off funding for the Iraq War and we are still there. By sending our hard hitting investigative journalists to cover Britney Spears, Paris Hilton and Lindsay Lohan, Americans have been lapping up the farce that the surge is working, the economy is not in recession, and there is no inflation, even as gas goes to $4 a gallon and food prices go through the roof. The new 911, the new false flag attack, orchestrated by Saudi King Abdullah, the Emir of Dubai, George Bush, Hillary Clinton and John McCain, is the deliberate crumbling of the U.S. economy, by artificially inflating oil which costs $2 per barrel to $200 per barrel. Our Saudi leaders have decided that when the American economy crumbles, the American people will fight like dogs to preserve their right to plasma televisions. The unspoken winning lying promise which propelled George Bush to two terms and will now hand John McCain the presidency, is that they will lead America in the conquest of the entire Middle East oil field, to save our economy and our security. John McCain is telling us that by singing a few verses of the Beach Boys classic “Bomb Iran” he is going to conquer the Middle East for US. Unfortunately Russia, China and Iran have formed a strategic and ecomomic alliance. Russia built the Iranian nuclear plant in Bushehr, delivered their latest zig zagging surface to air missiles to Iran, and China has partnered with Iran in the development of the Iranian oil fields. Just as Russia and China helped tiny North Vietnam defeat the United States, Russia and China are now preparing to help Iran defeat the United States. John McCain will be elected on the unspoken promise that he will be able to defeat 1.5 billion Muslims, Russia and China, and conquer the Middle East oil fields for the United States of America. John McCain is promising a peaceful uninterrupted flow of oil from our new 51st State the Middle East. We may be despised by the people of planet Earth and the countless species we have rendered extinct, but at least no one can say that we aren’t gullible. We believed Tricky Dicky, Bill Clinton and George Bush, and now, for an encore, we are all about to drink John McCain’s Kool Aid. L’Chaim!